We Are Here is a collective of more than 225 undocumented migrants and refugees – a political entity – that fights for the acknowledgement of each of its members as citizens. We Are Here strives for the right to self-determination of each individual member, which means: the right to equal political representation, access to education, economic participation, healthcare and other social services. Currently, undocumented migrants in the Netherlands have no right to vote, no right to education and no right to perform labour – not even unpaid charity work. This effectively forces them outside of the domain of international human rights that demands equal acknowledgement of every human being, regardless of their background and their educational or economic status. Following this principle of universal equality we demand the acknowledgement of We Are Here as an undocumented political party and as the legitimate representative of its cause: striving for the acknowledgment of the peoples of this world, documented and undocumented alike. In collaboration with Dutch academics, We Are Here has started the We Are Here Academy, which teaches undocumented migrants the political and juridical background of the Netherlands. 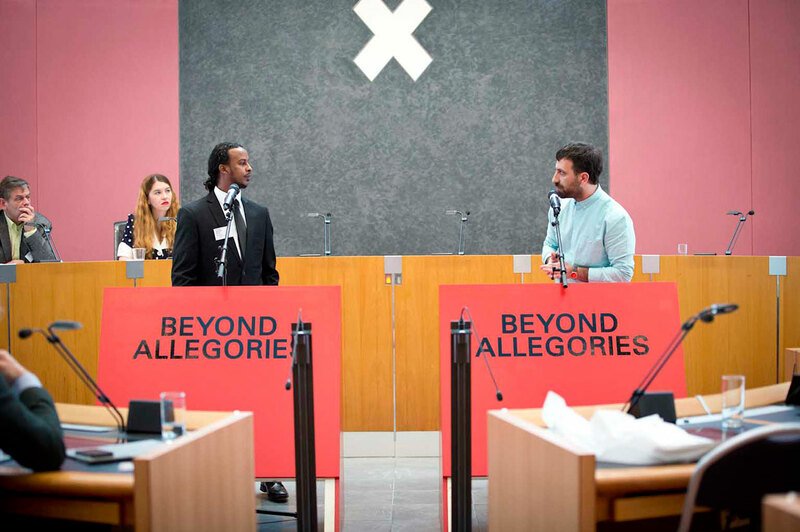 As the struggle of undocumented migrants is largely administrative by nature, it is crucial to gain an understanding of the structures that define a person in the Netherlands either as existent – as a citizen – or as non-existent – as a non-citizen. The latter consists of what theorist Giorgio Agamben refers to as “bare life” (life without administrative, state protection). The We Are Here Academy acts upon the right to education as a universal right, in a coalition of documented and undocumented people. We ask universities, art institutions, labour unions, political parties and civil society to acknowledge and support the universal right to education, and to acknowledge that the financing and organising of the We Are Here Academy is a collective responsibility of society at large. In collaboration with art institutions, universities and migrant organisations, artist Ahmet Öğüt initiated The Silent University, in which (undocumented) migrants and refugees with an academic background are acknowledged as teachers. The Silent University has departments in the United Kingdom, France, Sweden and Germany, and has contributed to providing legitimacy to undocumented migrants. Furthermore, the Silent University has brought attention to the fact that former migrants who receive citizenship are often not acknowledged for their academic backgrounds. This leads to the destruction of knowledge and of what artist Joseph Beuys refers to as “creative capital”. We ask universities, art institutions, labour unions, political parties and civil society to acknowledge and support the right to educate, and to acknowledge the teachers of The Silent University as bearers of knowledge with equal importance to that of so-called native teachers and professors. Ahmet Öğüt is a conceptual artist based in Amsterdam and Istanbul. Öğüt is the initiator of The Silent University, an autonomous knowledge-exchange platform led by refugees for refugees, asylum seekers and migrants. The Silent University aims to make apparent the systematic failure and the loss of knowledge and skills experienced through the silencing process of people seeking asylum. See further: www.thesilentuniversity.org.